For professional bouncy waves or defined curls, you don't need to rely on your salon. The ghd curve® range of tongs is an essential styling tool to help you get those long-lasting curls, whether you’ve got long or short hair. Using the patented ultra-zone technology, you’re guaranteed ultimate curls thanks to the ghd curve® tongs optimum curling temperature of 185°C and quick-thinking sensors maintain this heat and keep it even along the barrel, meaning that your hair is cared for while you're styling. Initially when I used this tong I thought the curls were too flat and fell out too quickly. However, then I watched a video tutorial on Hello to Beauty blog and realised how to tong my hair correctly with the tip of the tong pointing towards the ceiling (I had been doing the opposite way which looked terrible). This immediately created the soft wave effect I was looking for and I only needed to leave the hair around the barrel for 5 seconds so it is very quick to do the whole head. Great ... read more product, highly recommended but I do advise watching some beauty bloggers first to get a better idea of how to use this correctly. I have never been one to do much with my hair. More of a wash and go type person. I finally decided to grow out my hair after over 15 years of "short hair don't care" attitude. Growing it out meant spending time to blow dry and style it...time I thought was more precious doing other things. Curling my hair was always a chore. It never stuck, always flattened out after an hour. All that time spent on curling and no good results. That's until I experienced this curling iron! 15 mins....that's I ... read more all need to get a bounce and style that will last ALL day! It's just too easy with this curler! Thank you GHD for making an amazing product! 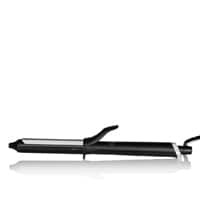 I'm 63 the age that grew up with curling tongs I've not used any for many years so when my husband brought me ghd classic hair tongs I was thrilled. They are a great product easy to use i love them.